The author describes how he scratchbuilt this model. Includes many construction photos and a parts list. The author builds two models from the kits, one a heavy-equipment-carrying car and a sand-and-gravel car. Includes completed-model photos. The author takes a Chesapeake Models' three-bay hopper and turns it into a B&O N-10f two-bay one. In this installment, the author installs the components of the Wangrow Electronics System One DCC system. A brief report and some photos taken at the 1996 NASG Convention. 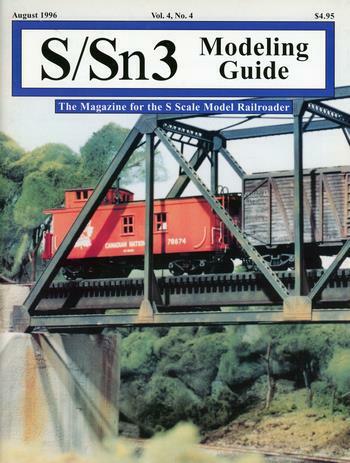 A report about the S-scale activity at the 1996 NMRA convention. The author describes an industrial critter that was scratchbuilt that he got in a trade. Mixing these two materials makes for a very strong bond, and can be used as a filler.